Communicating and sending SMS or text message is probably one of the popular culture nowadays and one of the main use of mobile cellphone. Windows Mobile Pocket PC Phone (PPC Phone) device also has SMS text messaging capability, but users have to tap screen several times before able to type a text message. 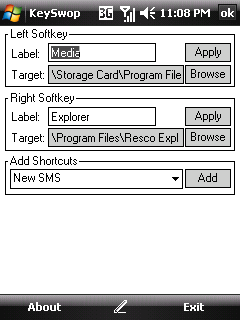 It’s much more convenient if shortcut to “New SMS” function been mapped and assigned to one of the softkeys on the PDA. KeySwop is a simple tool for Windows Mobile devices to change, manage or remap the softkeys on Windows Mobile Pocket PC Phone on the Today screen. Unlike other soft keys manipulation software, the unique feature of KeySwop is ability to add some shortcuts that are usually not found in the “Programs” folder, such as the highly requested “New SMS” shortcut. Download KeySwop (current version 0.2.2) or visit author’s homepage (no longer available). Copy KeySwop.cab to the PDA and run it at the mobile device to install KeySwop. KeySwop requires Windows Mobile 5.0 (WM5), Windows Mobile 6.0 (WM6) and above, and supports QVGA, VGA, WVGA and 240×240 screens.